Basswood trees grow in the hardwood growing regions of the northern United States to an average height of 65 feet. Basswood makes up less than 1% of the commercially available hardwoods in the United States. It grows fairly quickly and has exceptional longevity. Basswood’s sapwood is creamy white in color, while is heartwood is pale to reddish brown, sometimes with darker streaks. Its sapwood and heartwood are not always easily distinguishable. This creamy white, lightweight hardwood is fine-grained with negligible grain pattern. Basswood machines well and is easy to work with hand tools. It is a natural choice for carving and turnery because it cuts easily both with and across the grain. Basswood also glues, nails, screws, and accepts stain well. Basswood is often used to make keyboard pieces and musical instruments. It’s favored for shutters and blind slats, woodenware, matches, window sashes, picture frames, yardsticks and novelty items. Its light weight makes it especially suited for use in crates. Native Americans once used the bark fibers of basswood to make fabric, thread, bandages and other binding materials. 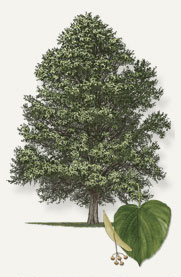 Adding to its many uses, the species is often called the boulevard tree and used in landscaping.